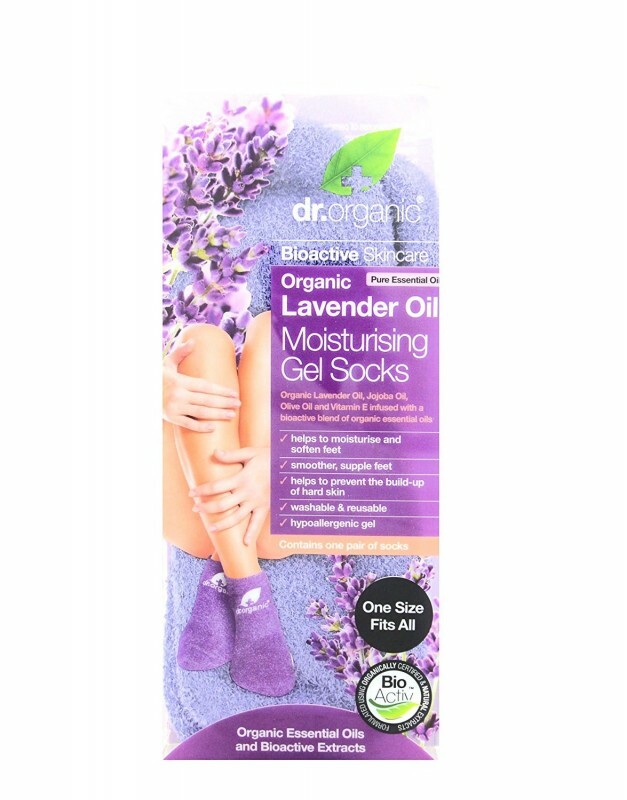 Lavender Oil Moisturising Gel Socks Gel socks based on organic Lavender Oil, Jojoba Oil, Olive Oil and Vitamin E and infused with a bioactive blend of organic essential oils. These socks will work wonders for dry, tired feet this party season. Just 20 minutes of pampering a day can turn dry, unattractive feet into eye-catching beauties. 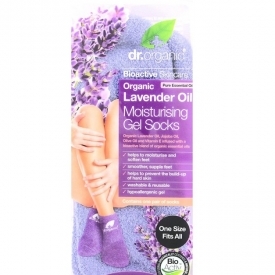 Simply slip on these organically infused moisturising gel socks and let their bioactive properties work their magic. In combination with the unique moisture locking gel, the specially selected ingredients are designed to restore and revitalise the skin, targeting dry, rough areas, leaving the feet feeling incredibly soft and beautifully conditioned. Lavender, used as an ingredient in skincare products is highly effective; calming, balancing and invigorating the skin; it enhances natural cell renewal, improving the skin's health and texture, so the skin is smoother, softer and luminous; it nourishes and fortifies the hair leaving it in perfect condition. Wear these on clean dry feet for 20 minutes a day for soft sweet smelling feet. Thermoplastic rubber gel, Lavandula angustifolia (Lavender) oil, Jasminum officinale (Jasmine) absolute, Pogostemon cablin (Patchouli) oil, Citrus bergamia (Bergamot) fruit oil, Cananga odorata (Ylang-ylang) oil, Simmondsia chinensis (Jojoba) seed. One in the Dr Organic lavender range that I won't be buying again. These Dr Organic products are often on BOGOF or similar in Holland & Barratt. This are a bit of a novelty I feel. They also make gloves which cost around the same. They are comfortable and nice enough but I am not sure they do much. "One in the Dr Organic lavender range that I won't be buying again. These Dr Organic products are often on BOGOF or similar in Holland..."